The downlink will be broadcast on NASA TV, and livestreamed at www.nasa.gov/ntv. 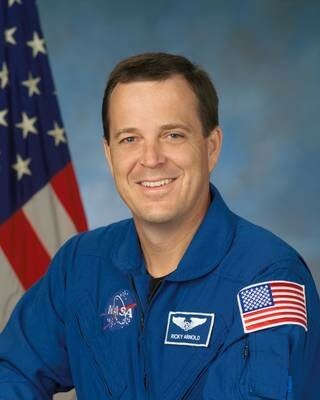 During the 20-minute live web conference, an astronaut onboard the International Space will answer questions asked by several individuals, including students from DSU and Madison Central Schools who will be in attendance. Richard R. Arnold II is currently scheduled for the DSU downlink. This is the Year of Education on Station, and Arnold is a former middle school teacher. Area DSU and Madison science students will watch the downlink and take part in associated events between 10 a.m. and 1 p.m. CT at Dakota State University’s Beacom Institute of Technology Collaboration Center. Guests are invited to view the downlink on NASA TV, livestreamed at www.nasa.gov/ntv. An exact time for the downlink will be determined closer to the event day. “We are very excited and honored to have been selected by NASA to host an education downlink session. This provides a tremendous opportunity for students and teachers to interact with an astronaut and educator onboard the International Space Station, whether they participate on campus, or tune in from across the state,” said Dr. James Maloney, assistant professor of physics at DSU. Inspiration is the reason the Johnson Space Center’s (JSC) Office of Education and JSC’s Public Affairs Office facilitate downlinks. The events are designed to encourage K-16 students to study and pursue careers in science, technology, engineering and mathematics (STEM). This is an effort DSU promotes as well, through technology-focused programs of study, and special programs such as DSU’s STEM Institute. Maloney is the director of the four-year old institute, which promotes recruitment, retention and graduation in STEM majors at Dakota State and interest in STEM career fields among their students. The institute is facilitating the downlink as one of six special STEM events planned for the 2018-2019 school year. “NASA and Dakota State University share a common goal regarding STEM,” said DSU President José-Marie Griffiths, “as we both consider it an important mission to promote the study of those disciplines.” The two have coordinated efforts previously, as the DSU Stem Institute is supported in part by a Project Innovation Grant from the NASA South Dakota Space Grant Consortium, and an Innovation Mini-Grant from Dakota State University. “By continuing to partner with agencies such as NASA, our efforts are redoubled to inspire and educate a STEM workforce that will contribute to significant accomplishments for businesses, industries and research organizations in the state, the country, and the world,” stated Griffiths. She recently participated in the 2018 STEM Education Summit hosted by The White House Office of Science and Technology Policy. Associated events taking place that day include: a demonstration by SDPB’s Science Steve (Steve Rokusek, a DSU alumnus); talks by Peggy Norris, Education and Outreach Deputy Director from Sanford Underground Lab, on radiation, on high-altitude balloon experiments, and an upcoming HASP (high-altitude student payload) project; and an information booth about SEDS USA (Students for the Exploration and Development of Space). Skype presentations are also planned with Dr. Laurie Barge, an astrobiologist and planetary geochemist at NASA’s Jet Propulsion Lab who is working on NASA’s Mars and Icy Worlds exploration missions, and Dr. Britney Schmidt, an astrobiologist and planetary geophysicist from Georgia Tech working on NASA’s Ocean Worlds exploration missions. Several of these speakers will be livestreamed.